Ideal for securing schools, sporting pavilions, hospitals, shop fronts, entrances and alcoves, cigarette counters, kiosks, storage areas and shelving and serveries. 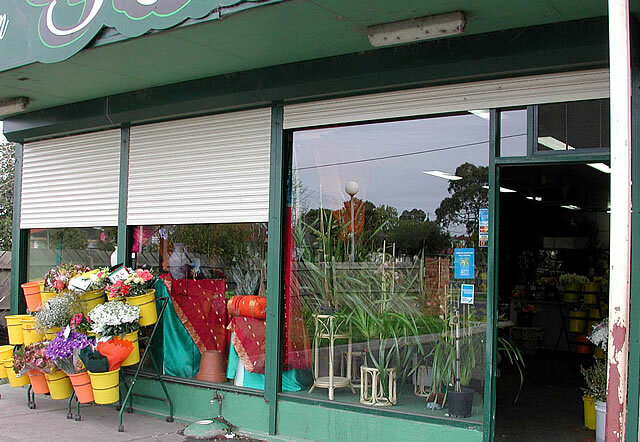 The AR6 & AR17 Extruded Aluminium Roller Shutters can span to any size up to four metres in width as a single roller shutter. Unlimited spans can be achieved by permanent or in most instances removable mullions. AR6 & AR17 Extruded Aluminium security roller shutters are sleek and unobtrusive in design. Integrating a Compact German Box System (tailored overhead pelmet) leaves doorways, entrances and mall throughways completely unobstructed as the shutter rolls up and into its compact pelmet box. Both extrusions are a double walled shutter and have a wall thickness of 1.2mm for extra strength. They slide into extruded aluminium tracks that are three times the strength and thickness of conventional side guides which also provide a solid anchoring point to effectively lock the curtain in position for extra security. The extruded profiles can be operated manually by means of a pull down key lock system, or motorised for ease of use by means of a flick switch, key switch or remote control. Our in house powder coating facilities allow you to choose colours from the entire Dulux range. Constant quality and sample testing of the finished product is performed to guarantee its conformity with manufacturing standards. AR6 & AR17 extruded aluminium roller shutters can be manually operated, although motorisation can be adapted in almost every instance. An assist torsion spring is designed to counterbalance the weight of the door promoting ease of use. 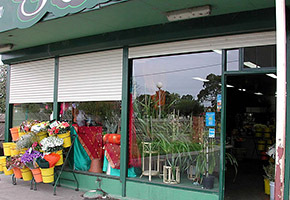 A 'D' handle can be fitted to assist in the raising and lowering of the extruded roller shutter. 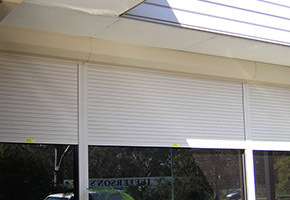 Larger roller shutters will require the assistance of space saving direct drive tubular motors (slide into the axle), which makes operating the security shutter as simple as flicking a switch, using a remote control or turning a key switch.